5. That Ogre is Amazing! 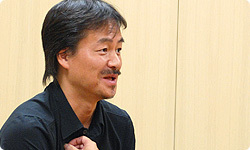 Sakaguchi-san, you have made games for a range of different platforms. I’d like to ask you straight out how you felt about developing a game for Wii. Well, now... Can I be completely honest? Yes, please tell me what you really think. Okay. When I worked on hardware platforms with HD displays11 that were higher resolution than Wii, I placed a lot of importance on the workflow and the ‘pipeline’12. This is something that is standard practice in the movie industry – ensuring that your work ‘pipeline’ is solidly in place, thereby ensuring you’ll create higher quality images. But this time round on Wii, I started by creating the prototype, and then worked on analysing that. That meant using a totally different method than I did for the hardware I’d worked on up to now. 11 HD stands for ‘high-definition’ and means that the resolution is higher than that used for analogue SD (‘standard definition’) television broadcasts. 12 The term ‘pipeline’ is used here to refer to the system which allows data, such as that used for graphics and animation, to be inputted easily into the software during the development process. So would you say that because you were working on Wii, you embarked on a lot of adventures and experiments and were able to make the game more expansive as a result? That was part of it. To be honest, I think that the HD images which have become mainstream in the TV industry are, for me personally, still rather over the top for the world of video games. There’s a tendency for developers to allow all their energy to be diverted into maintaining the high quality of the graphics. While it’s necessary to be able to fully utilise those graphical capabilities in the future, if it can take up all of a developer’s time, other aspects of the game end up being neglected. Yes, I agree. But I was really averse to allowing the quality of the graphics to drop just because we were working on Wii, which doesn’t have HD graphics. I do really think that, in the end, what we’ve created can hold its own against other hardware. We’ve successfully implemented the texture of rocks and water, for instance. The other important area is the motion. Ah, yes indeed. Normally, if the movement, the model and the resolution are not all more or less at the same level, there will be something unnatural about the motion. If one of those three elements is markedly superior to the others, it will tend to stick out. But in this title, they’re all perfectly in alignment. You can really tell how much energy you put into achieving this. That’s right. Balance is the most important thing. If one element is too high level, you have to tone it down, and if another element isn’t quite cutting it, you need to make it sharper. Did you take the decisions on those issues yourself? I made some of those calls myself, and of course the 3D art directors, including Fujisaka-san, also weighed in. We’d often have a drink and discuss the theory behind the game, deciding just what direction to take things in. People do tend to get the wrong idea about me if I don’t ensure that everyone is on the same wavelength. In what ways would you say you’re misunderstood? People often think that what I really want are beautiful still images. As there were members of the team who had never worked with me before, I knew I needed to talk to them and ensure we were all on the same wavelength. How do you divide the work up between those things you take care of yourself, and tasks you leave to other members of the team? I basically try to entrust as much as I can to other people as this will often yield good ideas you didn’t expect. Of course, I’ll make comments and suggestions, but the young staff will often go ahead and do things under their own steam, without me knowing about it. (laughs) That can lead to some striking results, and my aim is to successfully control this process so I can pass the baton to others and let them get on with it. What precisely do you mean when you talk about controlling that process? For instance, it means understanding that if I explain things in a certain way to a particular member of staff and put them in a certain situation, I’ll know what strengths they’ll bring to the task. If you can’t do that successfully, it leads to all sorts of trouble. You end up with situations where it’s quicker to just fix things yourself. If that happens, the actual game will lose its ‘power’. You really do need ideas and energy coming from different people or the game won’t end up being any good. When it comes to gathering all those disparate ideas and getting all that energy flowing in the same direction, what do you consider essential? Although it’s very time-consuming, the way I do it is to get an exchange going between myself and the team, thereby constructing a kind of channel between us. I’ll slowly but surely chip away here and there until I‘ve built this channel connecting my staff and myself. I think this ensures we’re all on the same page when it comes to making the game. You all share the same mindset. That’s right. The way I picture it is that this channel connecting me and the team actually defines our approach to the game, rather than it simply being a case of me dragging everyone along behind me. If the mindset of the team changes, the shape of this channel changes, and the game itself will change. The game will undergo a kind of positive chemical change. That’s why I feel that it was the make-up of the team that explains why The Last Story turned out as it did. Fujisaka-san, as a designer, how did you feel about working on Wii? Well, I’m a designer, so to be honest, at first I wanted a slightly higher resolution to work with, but over the course of the project, I reached the conclusion that there was actually no real problem with things as they were. In the end, you came up with higher quality graphics than you had thought possible. I think the graphics have a beauty that’s almost photographic. Rather than everything being clear and sharp, there are shadows in the background and slightly blurred elements that actually lend the graphics the feel of a photograph. I think that we achieved the perfect balance because this game was on Wii. So you really get a clear sense of having achieved that balance. Yes, I do. In addition, the Wii console was easy to program for. We were able to implement things down to the finest details. For instance, if you pass under a bridge, you’ll be bathed in sunlight. And if you are coming out of a dark place and pass under a bridge, everything around you will be bright, but in a soft way. It’s just like the way a real human eye automatically adjusts to light and dark. That makes it feel really good to go under a bridge. We’ve managed to put all sorts of touches like that in the game. I just couldn’t stand the idea of limiting ourselves just because of the resolution of the Wii console. (laughs) The staff responsible for the 2D side slaved away in the background, really putting a lot into this. The 3D art directors really gave it their all too. That’s why in the end it doesn’t look inferior in the slightest when compared to the graphics and resolution on other platforms. So you refused to use the fact that it was for Wii as an excuse, and you resolved to give it everything you had. There’s something else I’d like to ask, this time about making an RPG. While there are people who are huge fans of the genre, there are also those people who feel that there is a lot of prior knowledge players are assumed to have, even if they’re unfamiliar with the game, and that RPGs are therefore somewhat inaccessible. 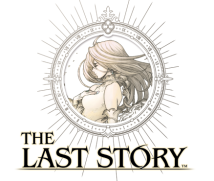 I feel that in The Last Story, however, the new system it uses means the door is open equally to RPG fans and those who are new to the genre. That’s right. I think that the fantasies that unfold in RPGs make for really appealing game environments. For instance, when Lord of the Rings13 came out at a time when sci-fi was dominant, I realised how much I liked that world, and how familiar it felt to me. How can I put this? I think, with a primordial world of gods, a world of myths that form the foundation of human civilisation, when this kind of world is successfully realised in an RPG, I think a lot of people will be naturally drawn to that. 13 The Lord of the Rings trilogy of films based on the JRR Tolkien novels was released between 2001 and 2003. Yes, you’re right. I think it’s best to just be natural. You can’t be smug or self-righteous and make the system intimidating for people. But by the same token, I don’t think there’s any need to be too eager to please. I’ve always wanted to make games in an uncontrived, natural way.